Arrow Season Six Blu-ray Review! Crisis on Earth-X Episodes And More! Arrow: The Complete Sixth Season Blu-ray Review – Crisis on Earth-X And More Content! Arrow season six ended up being much better than some of the previous seasons. As a fan, you can currently own the Arrow season six Blu-ray or the DVD release by Warner Bros. Home Entertainment. Both contain all 23 episodes from the season as well as the four ‘Crisis on Earth-X’ Arrowverse crossover episodes and extra content. In Arrow season six we saw the story continue after Team Arrow was caught in the blast Prometheus caused in Lian Yu. The only major casualty was the mother of William Clayton (Oliver’s son). The sixth season also showed Diggle wearing the Green Arrow suit when Oliver decided to spend more time with William. There was also a lot of fighting inside Team Arrow which made for some unnecessary drama. But then again, this is a CW show and drama is bound to happen. The antagonists were Cayden James (Michael Emerson) and Ricardo Diaz (Kirk Acevedo). As a computer hacker and a crime lord, both characters served as more grounded villains for Team Arrow. The show even gave Diaz an origins episode. For more superpowered action, the ‘Crisis on Earth-X’ crossover more than delivered during Arrow season six. It dealt with Nazi versions of the heroes from a parallel dimension. We first saw them in The Ray. So, it was fun to see their live-action versions, too. 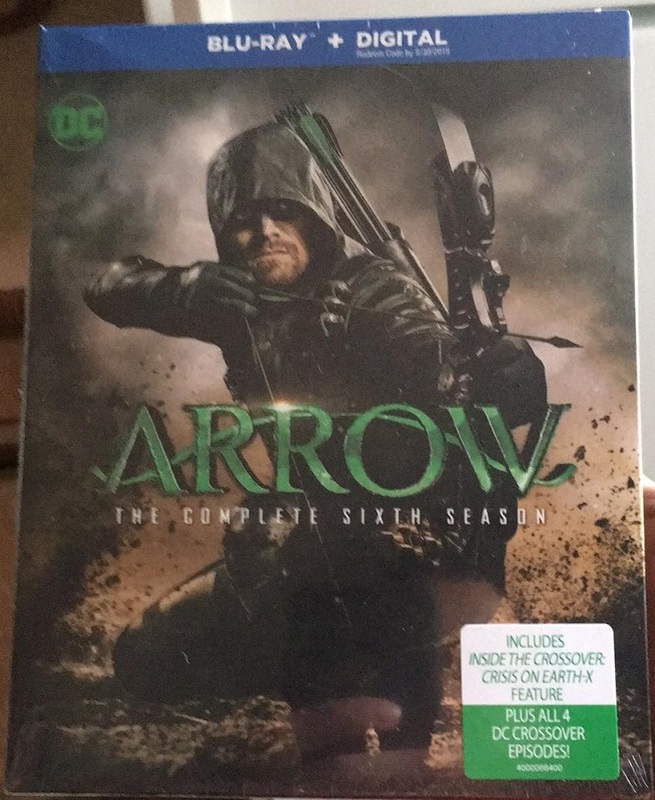 I appreciate Warner Bros. Home Entertainment offering all four crossover episodes in the Arrow season six Blu-ray and DVD release. Now, you won’t have to buy the rest of the Arrowverse shows if you don’t want to. The sixth season of Arrow also featured the return of Roy Harper (Colton Haynes). The finale showed Oliver admitting to the public about being the Green Arrow. The series is set to return for a seventh season on October 15, 2019. Coming to the packaging, the front has the main image with the back showing a synopsis and details about the 4-disc Blu-ray release. The Blu-ray also contains a Digital version. The video presentation is an AVC encoded 1080p transfer in 1.78:1. While the cast looks great in such a high quality video offering, the CG can seem a bit too fake at times. The sound is DTS-HD Master Audio 5.1 mixes. From the loud action sequences to quieter character interactions, I found no audio problems. Disc One: The Split of a Man: Deathstroke (1080p) – Almost a 12-minutes long look at Deathstroke played by Manu Bennett. Disc Two: Inside the Crossover: Crisis on Earth X (1080p) – Approximately 42-minutes long, this is an awesome look at how the enjoyable crossover was created. The good news is it talks about the entire crossover instead of just focusing on the Arrow episode. Disc Three: Revenge in Ones and Zeros: The Story of Cayden James (1080p) – A 11-minutes long look at Cayden James, the villainous hacker in this season. Disc Four: The Best of DC’s Comic-Con Panels San Diego 2017 (1080p) – Nearly an hour long, this feature showcases the different DC Comics-based shows’ appearance at San Diego Comic-Con 2017. Currently available, Arrow season six Blu-ray is going for $49.99 SRP while the 5-disc DVD release will cost you $44.98 SRP. Are you a fan of Arrow? Have you picked up the Arrow: The Complete Sixth Season release? Let us know.